Riding my Nerve beach cruiser along the iconic Wilshire blvd without cars seems crazy, but not when it’s CicLAvia. 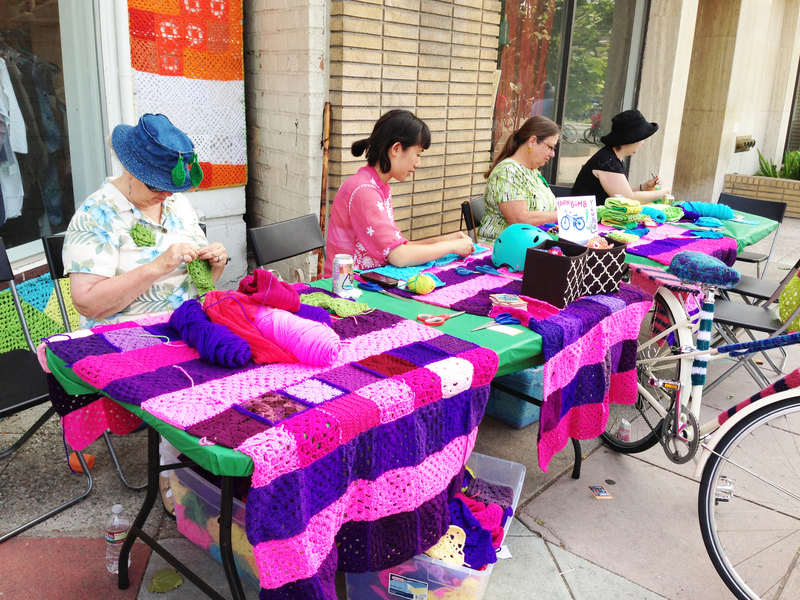 A wonderful program started by CARs (community arts resources). A completely free event open to the public even if you don’t own a bike. It welcomes walkers like the LosAngelesWalker.org group, skateboarders, roller-bladers, roller-skaters, unicyclists, tricyclists, and a lot of other types of creative inventions on wheels. Riding with over a 100,000 people easily, I was bound to run into someone I knew, like Mike Mendoza of @ VeganBeastMode. Yesterday’s ride started at the beginning of Wilshire Blvd in DTLA with plenty of pedestrian zones and mandatory dismantle zones to get you ready for the ride west to Fairfax. 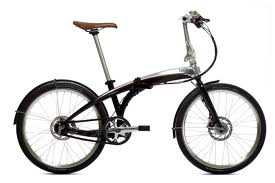 Tern set up camp showcasing their amazing foldable lightweight bikes that I so desperately want!! The Eclipse S11(i) is such a beauty! Another vender who set up camp was REI, complete with a rock wall! Plus, CicLAvia had multiple first aid tents all along Wilshire in case people needed water to hydrate or bandages for their falls. I didn’t see any wipeout, but I did see a cyclist riding way too fast through an intersection and almost taking out a lady stationary on her bike and a traffic cop! yeah, that was nutty. 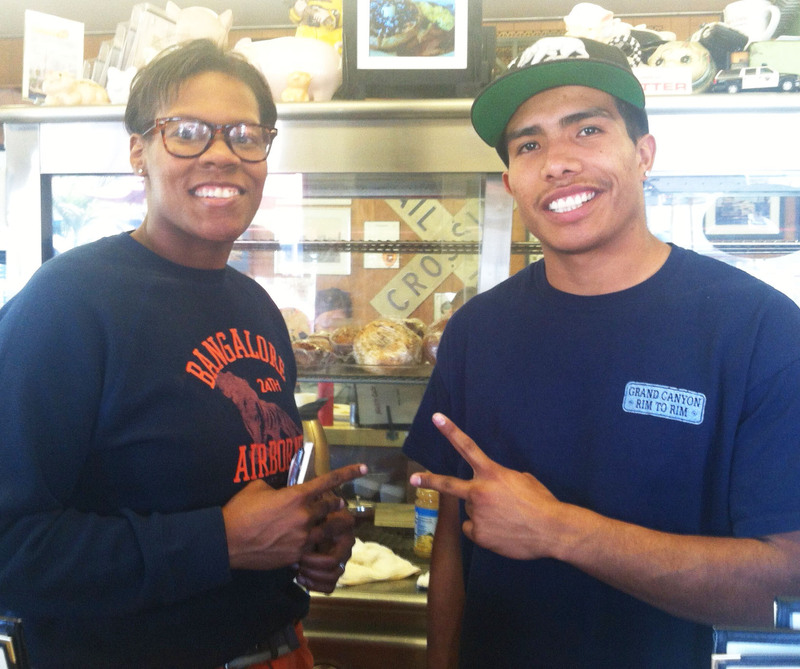 CoCoHoDo is located 3500 w.6th st. 90020. K-Town had the right idea with programming their yearly KBBQ festival on the same day as CicLAia so we (boyfriend, friend [also bloggers] & I, ) stopped for a look around. Thanks K-Town! I’m not a meat eater so finding vegan food was tricky. 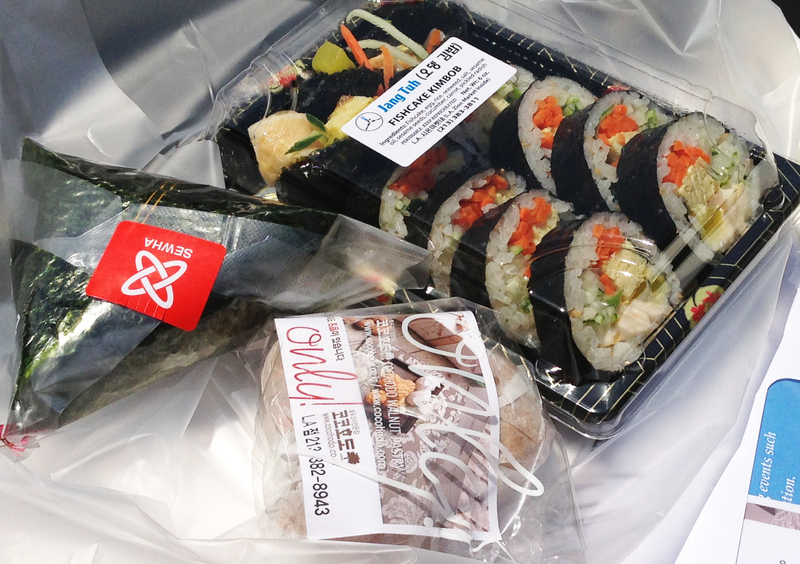 I settled with a vegetarian meal of… Samkak, Gimbab, and two cocohodos. Cocohodos are a walnut pastry. Basically walnuts in bean paste wrapped in a pancake or at least that’s what it tasted like to me. Riding west on Wilshire we entered into Miracle Mile where LACMA, CAFAM, the new Academy Museum, The Petersen Automotive Museum and the La Brea tar pits are located. Everywhere you looked there were people! 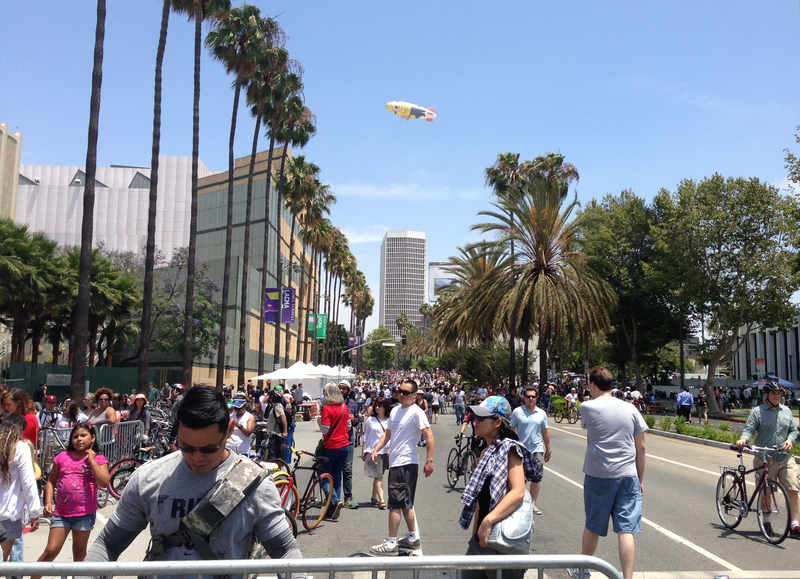 A sea of people out enjoying their Sunday thanks to CicLAvia. LACMA set up shop with tents that offered temporary tattoos, spin art, a photo booth and an informational booth. Across from LACMA was CAFAM which I am sure if you have driven or taken the bus along Wilshire you will have recognized the colorful crocheted building. 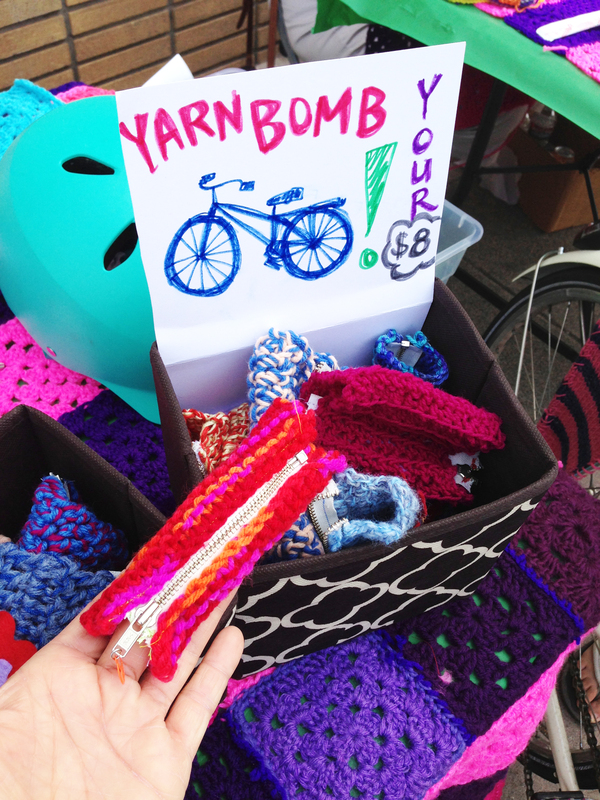 Yarn bombers parked themselves in front selling their “bombs” to the many cyclist that promote this noble cause. You can read more about it here. 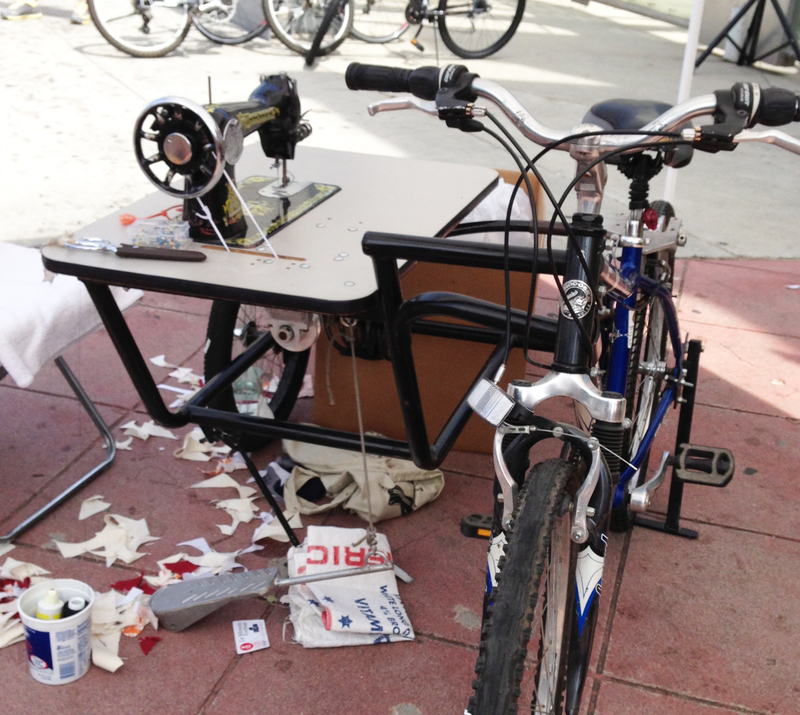 sewing machine is run by this bike. 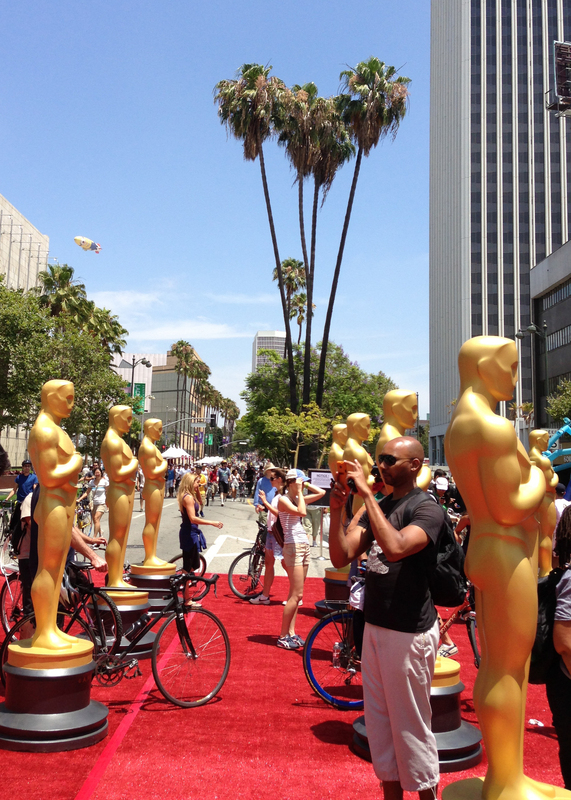 In the middle between the Petersen Museum and the new Academy Museum were these huge Oscar statues standing on none other than red carpet. Everyone was taking their photo with them. Why not, right? Thanks to The Petersen Museum everyone was able to make their very own license plate. Super cute for all ages! 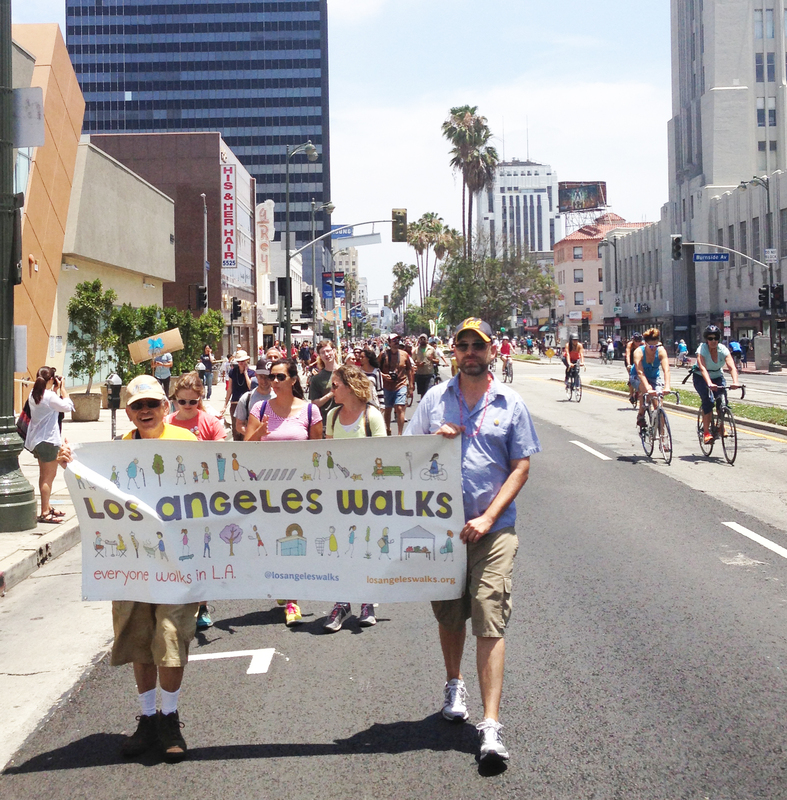 If you have never taken part in CicLAvia you are indeed missing out! Come any way you can with anyone you want. Families, couples, friends, foreigners, and your pets! I am still trying to figure out how I can bring my cat. I saw so many dogs of all sizes and even birds! Los Angeles truly has so many fun free events that I couldn’t imagine living anywhere else. Today was such a great day. 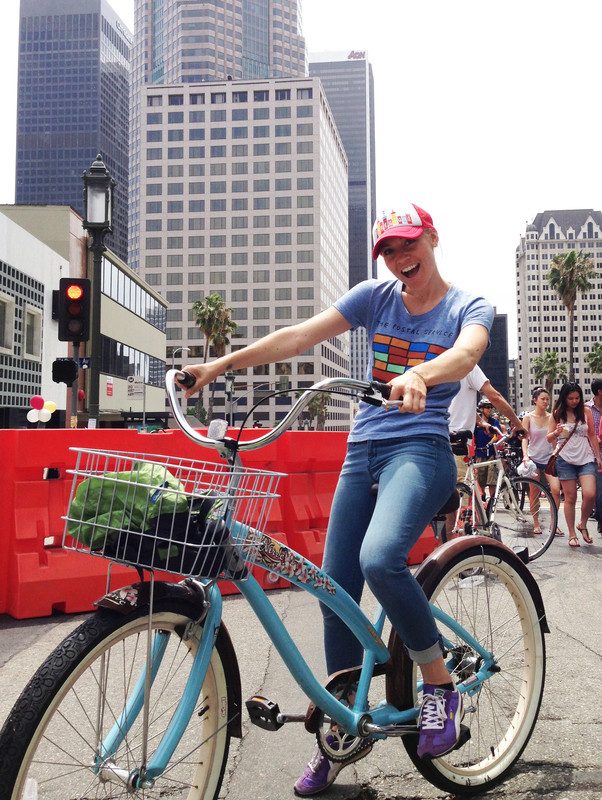 I can’t wait for the next CicLAvia! Today is the day where cyclists unite and ride car(e)free from DTLA to the beach. 15 miles one way. Starting at Union Station in downtown Los Angeles and ending in Venice Beach. How awesome is that?! 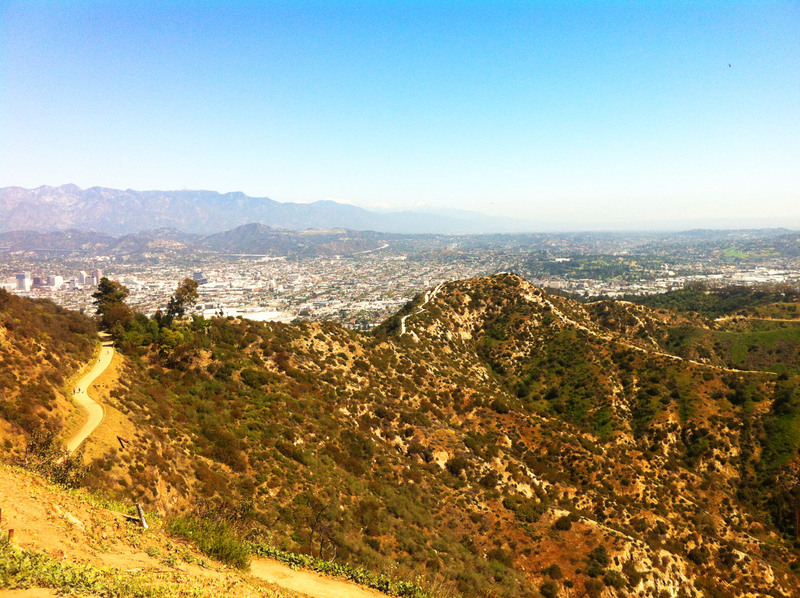 It’s a gorgeous day out so get your bike and ride on! Wether you ride for a mile or the full trek, today is your day to take advantage of a bike path through the city, without cars trying to run you off the road. They are estimating 100,00 people will participate in today’s largest bike ride yet. 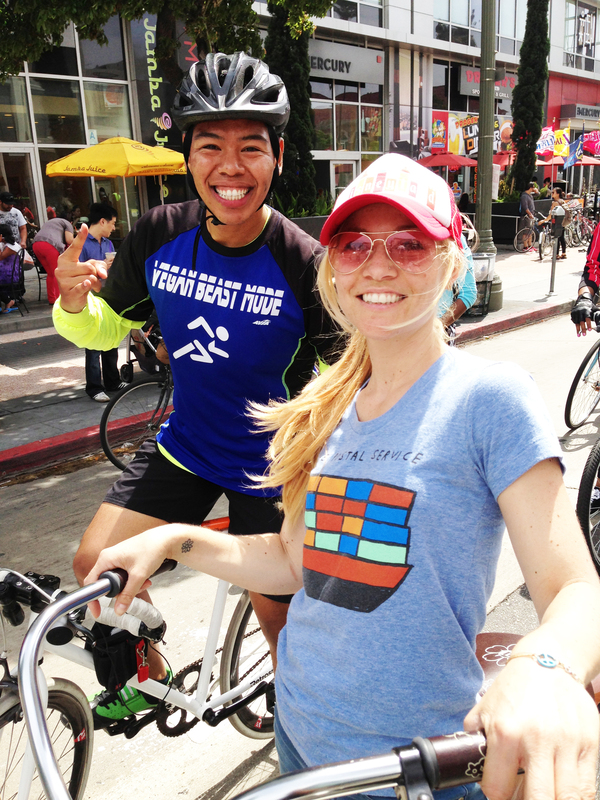 So, come take part in this fun-filled carfree sunny southern California bike ride. Check the map for road crossings for cars and the direct path for “bikes only” straight to the beach! You can always come out in support of riders throughout the route, cheering them on, taking photos, offering waters or riding with your kids a few blocks in participation. This event is for everyone. 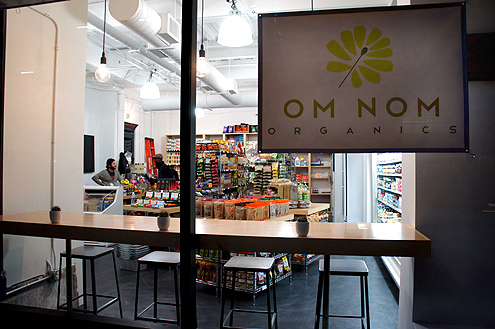 Start in DTLA or even in Venice Beach to ride back to DTLA. 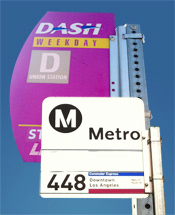 Many public transportation systems are available to help out in your trek. There will be hubs all throughout the route. 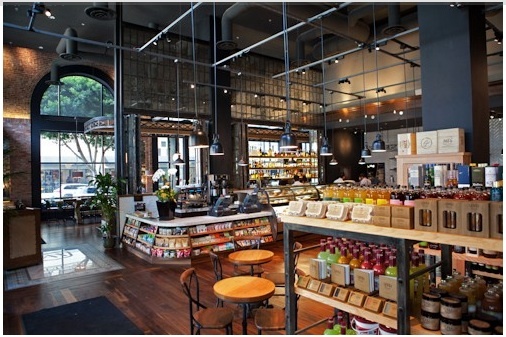 Click here for hub locations. 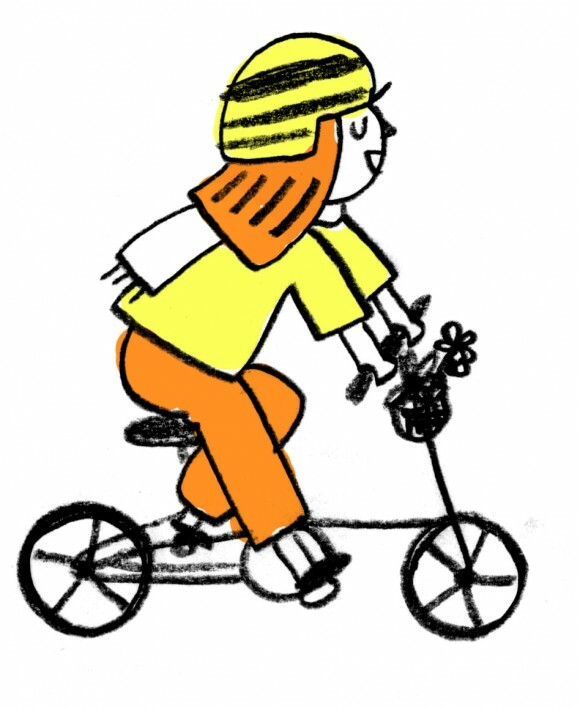 In Venice Beach there will be a kids zone to partake in a bike skills workshop and hone in on their biking skills complete with obstacle course and helmet giveaway from 11am-1pm. Thanks to Walk’n’Rollers. Click here for safety tips. Especially if your children are joining you. There will be a lot of people out today, so stay safe people! For those of you without a bike, take your scooter, skateboard, roller skates or even walk along with everyone. 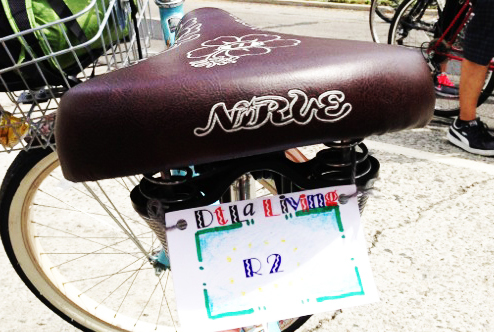 Click here for a few places to rent a bike along the route. P.S. 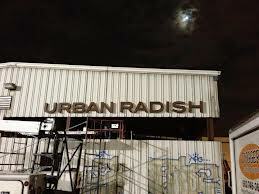 Rumor has it DTLA is starting a BIKE NIGHT… hint hint… DowntownMuse. Are you looking for something to do this weekend? 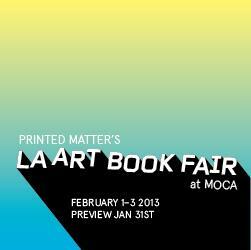 A few great places to start would be the LA Art Book Fair at the The Geffen Contemporary at MOCA. Hundreds of art books on display from oldies to goodies, prints to catalogs. A delight for your artistic side. Take a friend and wander the isles of art literature from all over the world. Pick up pretty prints for your sweetie or rocking awesome zines, Valentines day is on it’s way. They even have a few book signings, so check their schedule to not miss out. 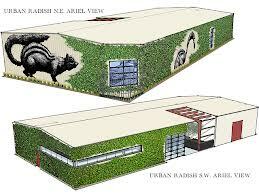 The LA ART BOOK FAIR is free and open to the public. 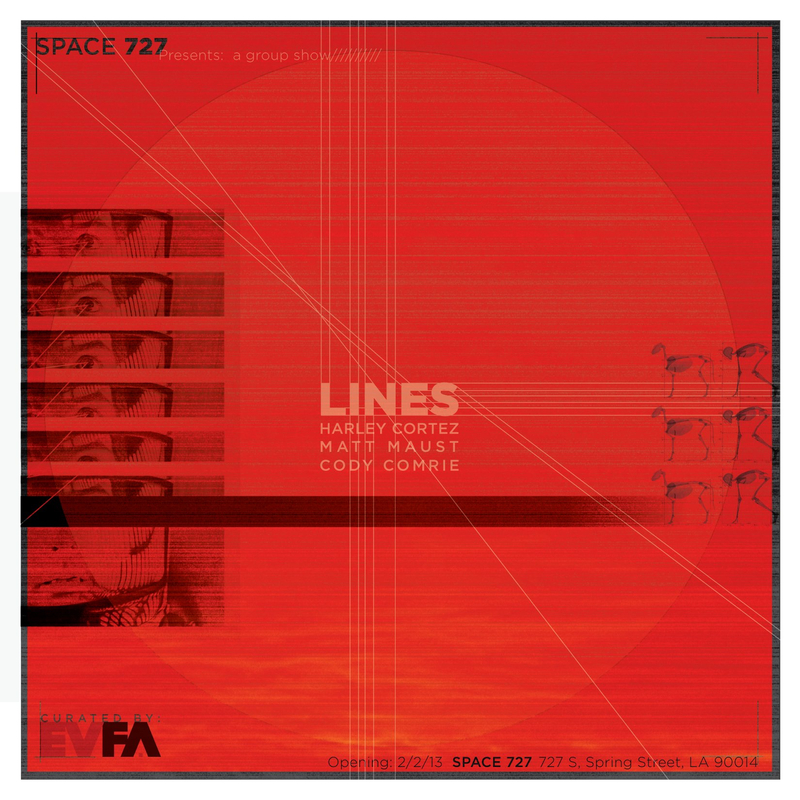 Saturday night at Space 727 Art will be all over the walls in the newest group exhibition entitled LINES featuring artists, Matt Maust, Cody Comrie, and Harley Cortez. From floor to ceiling drawings, paintings and prints are on view for the art (and music *hint hint*) lover in you. These are very talented men showing off their creative side off stage. I wouldn’t miss it if I were you. It’s only up for a week, so join the reception Saturday night February 2nd from 6:30-9:30pm. Space 727 Spring Street, DTLA. Go for a walk in the city. 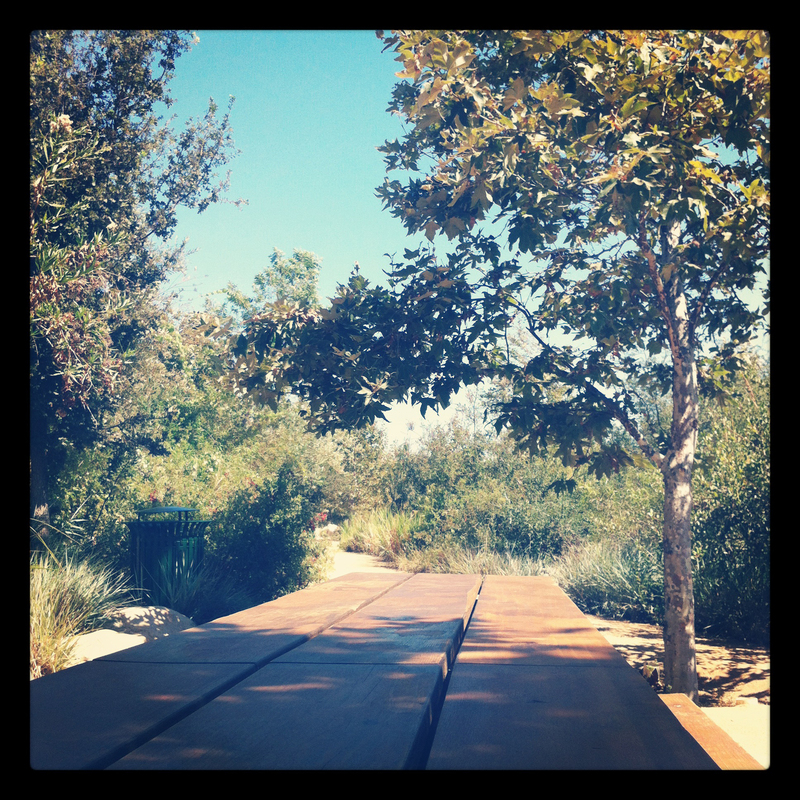 Go for a long walk up to Vista Hermosa park. It might be a bit of a distance, but it proves to be such a gem. With views only wishes are made of. It’s 10 and half acres of walking trails, streams, kids playground, and hidden away picnic areas. 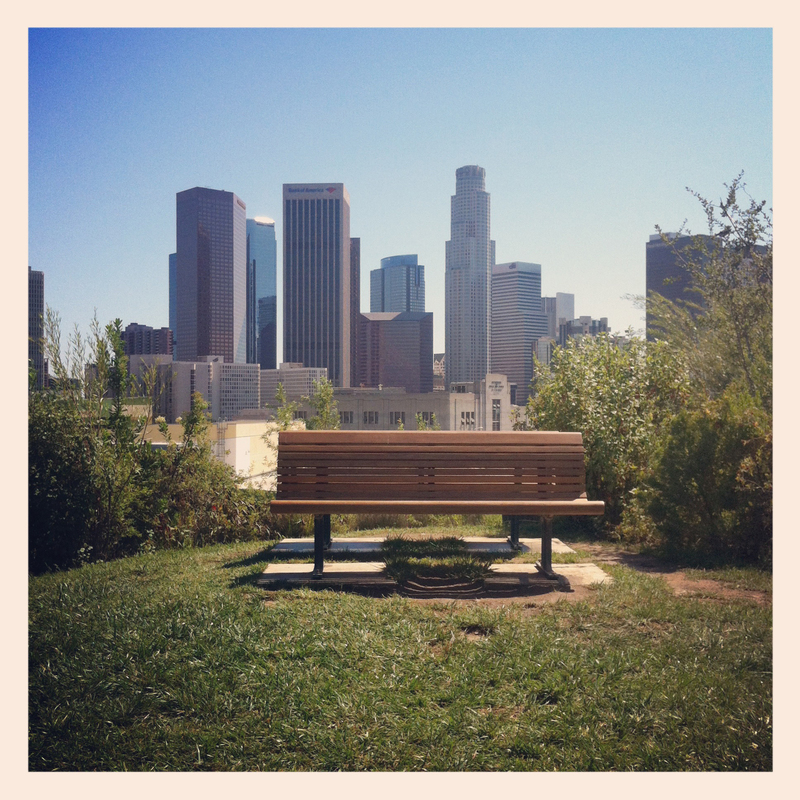 Gorgeous meadows and the perfect city bench overlooking a vast meadow and the best view of DTLA! Scope out the perfect spot for your Valentines Day picnic. 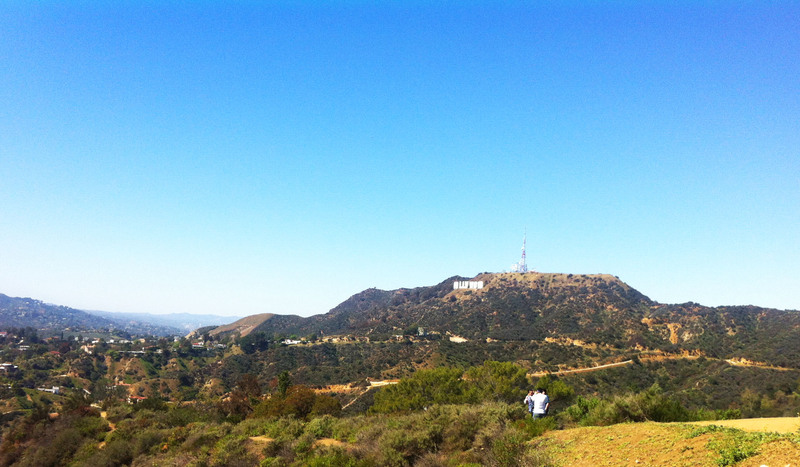 Romance is not lost in LA, certainly not DTLA. 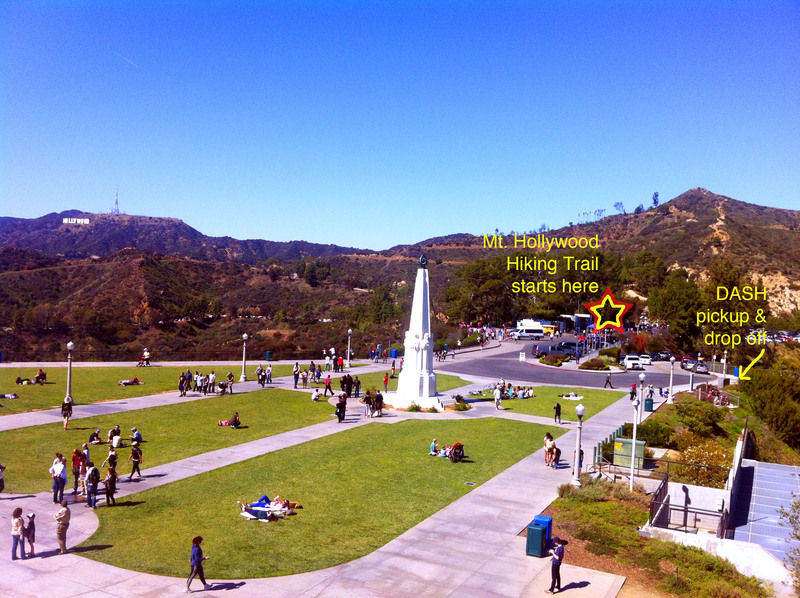 This park is really a treat. So much thought and heart went into creating such a beautiful retreat. Did you say 50¢ ? Living in downtown is great because you can more or less get anywhere within DTLA on foot or by bike. However, if you are in need of a ride take the DASH! I normally can walk most everywhere within downtown. I live in the historic core which is in the middle of things, so walking around is easy peasy. For days where I am exhausted, it’s raining or way too damn hot DASH is the way to go. Like say for instance… you want to head up to Chinatown and eat dim sum. Take bus/route B that circles the financial district (which is more or less on Grand Ave at 6th Street), it heads up Grand Ave to Alemeda St where you can get your picture taken with the Tijuana donkey on Olvera St, timeless! Then it zig zags through the eastern part of Chinatown near the Gold line station, Chinese Cultural Center and adjacent to the Los Angeles Historic State Park. 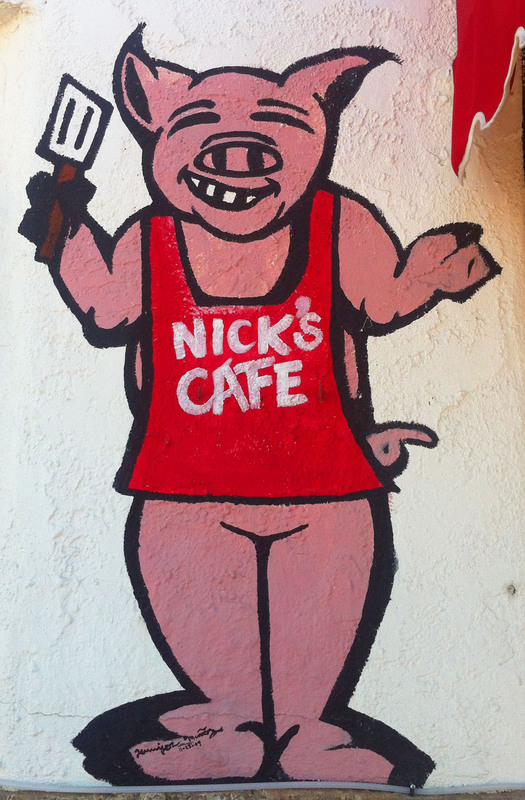 A huge park located on Alemeda St. and my favorite, Nick’s! Bring your frisbee or go for a run, then back again to the Financial district. Easy! Now let us say that you aren’t the best walker. The D bus/route is the best! It runs almost the entire “downtown”. DASH D is my friend when I just can’t walk anymore. It starts at Union Station (This train station hasn’t changed its interior since the 40’s!) and meanders through to City Hall where the new Grand Park is located. Definitely check it out! Then south on Spring St through the historic core past South Park close to LA Live and the Staples Center to Figueroa Street near Mount Saint Mary’s college and the expo line (USC route). Ok, now you know a few routes to get you by, but there are more! 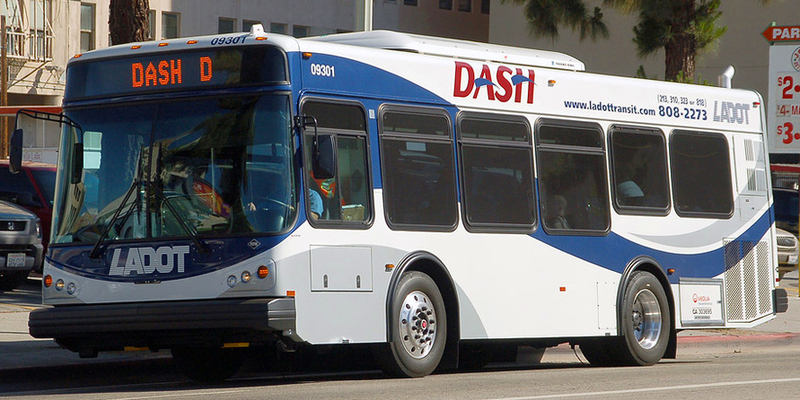 Routes A, B, D, E & F. Most routes run from 6- 6:30am or 7pm every 6-10 minutes Monday through Friday. 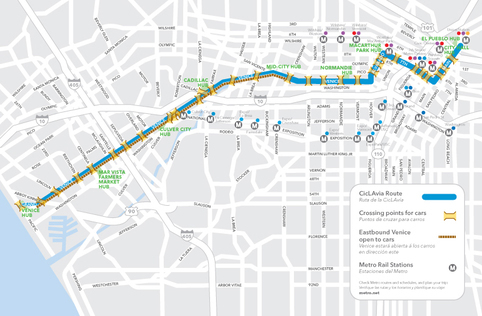 Weekend E and F routes are slightly altered. E runs every 6 minutes from 6:30am-5pm on Saturday. 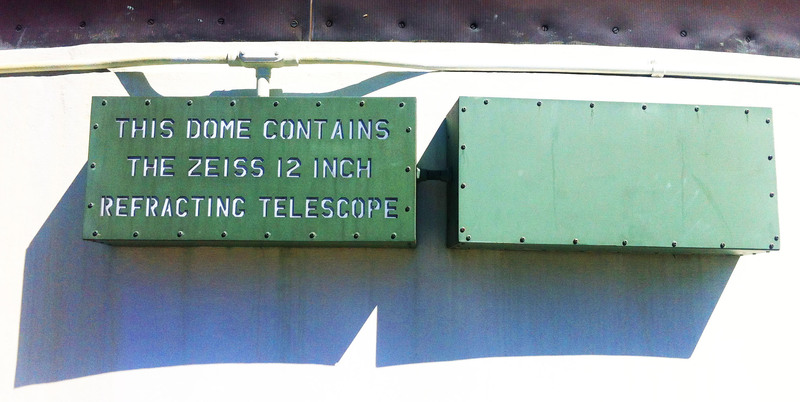 However, on Sunday it runs every 15 minutes from 10am-5pm. Route F runs every 20 minutes both Saturday and Sunday from 10am-5pm. And did I mention it’s only 50¢? Yeah, that is a deal! With comfy seats and A/C, too. Be sure to pick up a brochure when you get on the bus to ensure you have the map and route schedules. It’s very helpful until you learn the routes by memory which I still haven’t, sigh. Of course, you can also be eco-friendly and just look it up via the world wide web. GTS, yo! And, please have exact change the bus driver isn’t your banker. Win a FREE ticket (valid for one person) to tonight’s opening premier party (8-11pm) for the LA ART SHOW 2013. This Friend level ticket is valued at $125. Included with this VIP ticket you will receive the show’s catalog (valued at $20), Fine food, wine, and full bar at the premier party, opportunity to view (and purchase) art before the general public as well as unlimited admission to the LA Art Show throughout the show’s run. As well as unlimited access to the City National Bank VIP Lounge. Share ANY of my stories on your Facebook or Twitter account. Tag @DTLAliving (so I know you posted). This ensures your name to be entered in the drawing. At 4pm (today) I will announce the winner on my Facebook and twitter pages. Have you already “liked” my page on Facebook and followed me on twitter? If not, here is your chance for fun reads and a great prize. 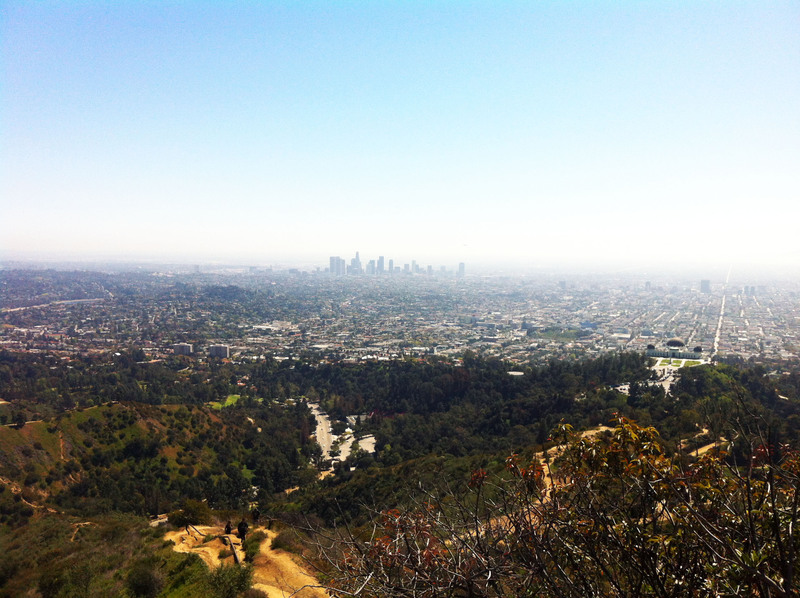 Also, you can follow my blog at www.DTLAliving.com to stay in the loop. 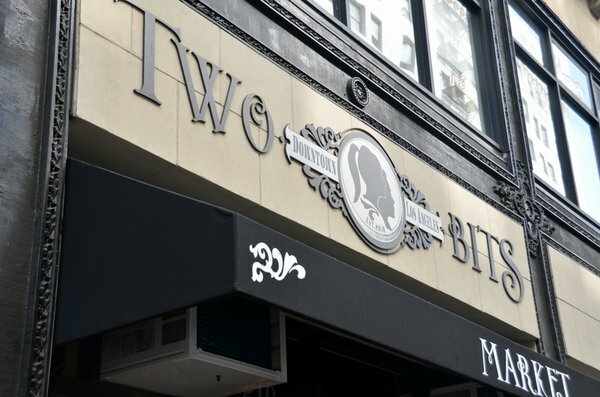 The WINNER can pick up their ticket at Space 727 Spring street DTLA 90014 between the hours of 4-7pm. The LA ART SHOW 2013 is modeled after an art museum experience where collectors may view diverse genres of art under one roof, the LA Art Show features four distinct sections: The Modern & Contemporary Section, The Historic & Traditional Contemporary Section, the Vintage Poster Section, and the Los Angeles IFPDA Fine Print Fair Section. The Show also features a special exhibition, China: FUSION, a 3,600 sq ft space highlighting contemporary Asian art from mainland China.